Start the presentation by selecting “View show” from the Slide Show menu. 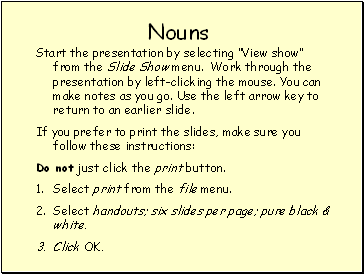 Work through the presentation by left-clicking the mouse. You can make notes as you go. Use the left arrow key to return to an earlier slide. Do not just click the print button. Select handouts; six slides per page; pure black & white. They name people, places and objects. They can also name ideas, emotions, qualities and activities. Peter, Elizabeth, driver, sister, friend. Bristol, Severn, Brazil, pen, dog, money. Love, beauty, industry, nature, greed, pain. 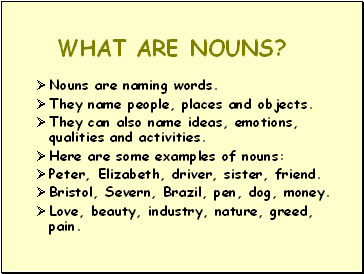 All nouns can be divided into common and proper nouns. 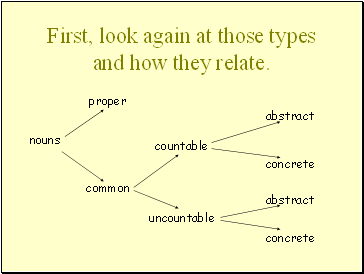 Common nouns can then be divided into countable and uncountable nouns. 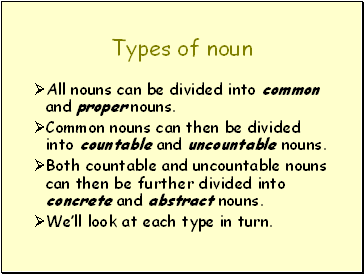 Both countable and uncountable nouns can then be further divided into concrete and abstract nouns. We’ll look at each type in turn. First, look again at those types and how they relate. Proper nouns start with capital letters. 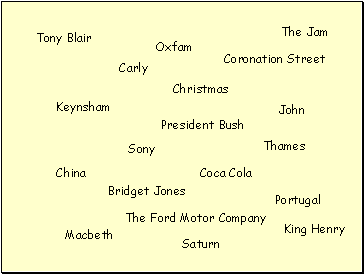 They are the names of people, places, times, organisations etc. They refer to unique individuals. Most are not found in the dictionary. They often occur in pairs or groups. 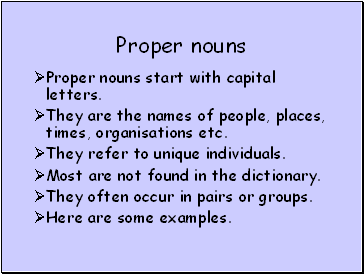 All nouns which are not proper nouns are common nouns. A few examples: cup, art, paper, work, frog, bicycle, atom, family, mind. 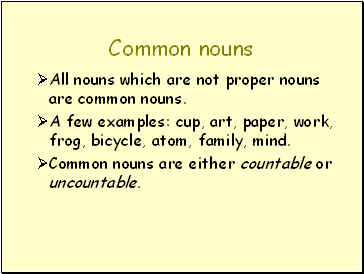 Common nouns are either countable or uncountable. 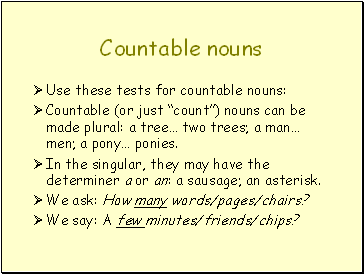 Countable (or just “count”) nouns can be made plural: a tree… two trees; a man… men; a pony… ponies.